The Allied naval attempt to force a fleet through the Dardanelles was the first part of the Allied Dardanelles and Gallipoli campaigns, an attempt to drive Turkey out of the war by seizing the Turkish capital of Constantinople and overthrowing the government, replacing it with one more favorable to the Entente powers. Although many in the British Navy insisted the navy's role in an attack would be to transport and support an invasion force, others, including First Lord of the Admiralty Winston Churchill, argued that a purely Naval assault could succeed, that it could “force the Straits”, with French and British ships out-duelling the Turkish forts on the European and Asian sides of the Dardanelles, making their way to and across the Sea of Marmora to Constantinople itself. Although French and British warships commanded the sea, and blocked the entrance to the Dardanelles, they operated on outdated information about the state of the Turkish forts at the entrance to and along the Strait which the Turks had enhanced with German guns. On February 19, 1915 Allied warships began their assault, shelling the outer forts and putting some of them out of commission. As the Turks abandoned the forts, the Allies landed demolition parties to reduce them further. Inclement weather minimized further attacks, but on March 18 the weather improved and the major Allied attack began. 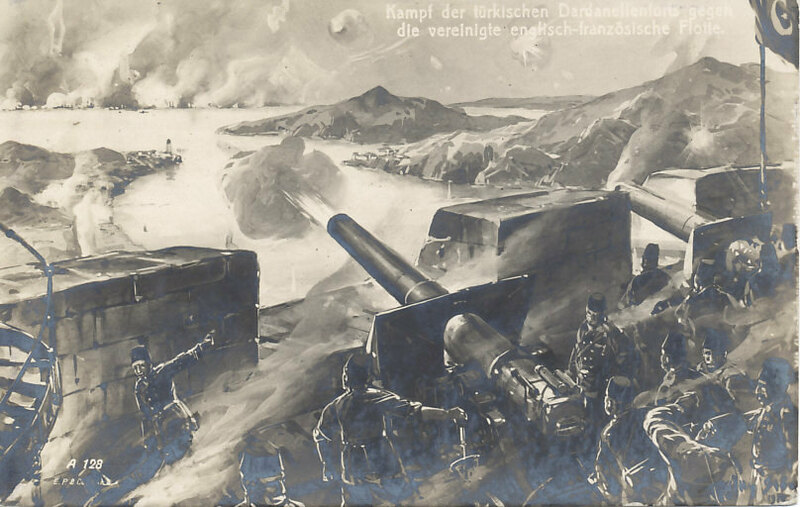 The first line of five British ships advanced into the Dardanelles, shelling the forts and making steady progress. The second line of French ships then advanced. One struck a mine in an area thought to be free of them and sank in minutes, losing 640 men. Two British battleships were hit, and one of them sank. The allied fleet withdrew. With the loss of the ships, those opposed to further naval assault prevailed, and the planning began for an invasion on the Gallipoli Peninsula. The Allied naval campaign in the Dardanelles is part of The Allied Campaigns in the Dardanelles and Gallipoli.